Centrifugal Pump Systems | EGM, LLC. EGM designs and builds skid-mounted centrifugal pumping systems for a wide range of applications. 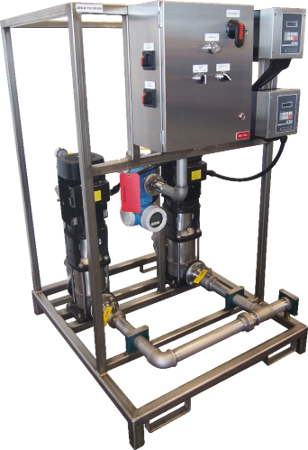 Systems are most commonly built with stainless steel materials of construction for use in water, wastewater, pulp and paper, mining, and municipal applications. Thermoplastic or high alloy systems can also be constructed for use with aggressive or corrosive chemicals. System designs from EGM include units built for transfer pump duty – operating intermittently by remote start / stop commands or by local timer control panels; pressure-controlled systems - built for both clean and contaminated fluids; and flow-controlled systems – used in conjunction with either variable frequency drives, control valves, or self-adjusting devices. 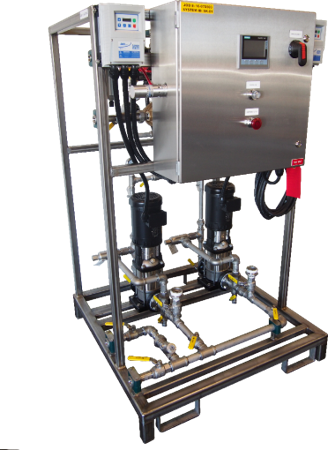 Skid mounted systems have been constructed with pumps that range in capacity from as low as 5 GPM (for process sampling systems) to large dilution water pressure boost units that pump more than 400 GPM flow.